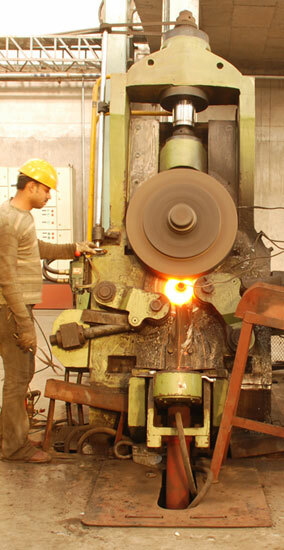 Radial Ring Rolling is used for rolling Hot Blank in Single or Double Pass depending on Profile of Ring. A Multitude of profiles (Ring with Inner & Outer profile of various kind) can be rolled precisely. Sensitive and infinitely variable control of rolling pressure and centering arms guarantee truly circular rings with identical diameter. Seamless rolled ring manufacturing offers an inherent product advantage : Desirable grain flow characteristic and grain refinement , resulting in improved mechanical properties and metallurgical soundness , for delivering increased strength in final product as required. Range Diameter 50mm to 350mm.